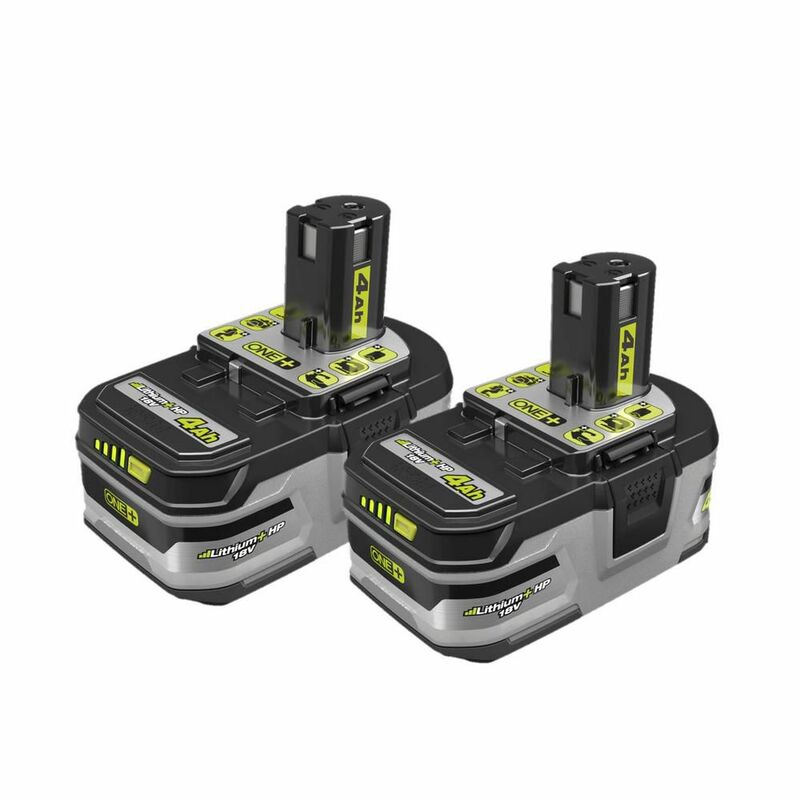 RYOBI introduces the 18V ONE+ Lithium-Ion LITHIUM+ HP 4.0 Ah High Capacity Battery (2-Pack). These batteries feature advanced electronics to allow you to maximize tool performance with added capacity to all 18V ONE+ tools. With superior runtime, power, and performance, these batteries can take on more demanding applications than ever before with the introduction of HP technology. HP technology communicates with brushless tools to maximize performance in all applications, allowing users to make faster cuts, drive larger screws, utilize bigger drill bits, etc. It has a durably constructed frame for impact protection and has a built-in 4-bar illuminated charge indicator. These batteries can be paired with over 125 tools from RYOBI's 18V ONE+ lineup. Backed by the RYOBI 3-Year Manufacturer's Warranty, these batteries include an operator's manual. Charger sold separately. The Makita 4.0 Ah battery offers maximum run time for prolonged, heavy-duty applications. 4.0 Ah battery offers 33% increased run time versus 3.0 Ah batteries with no added weight or bulk. LED charge level indicator displays approximate remaining battery power. Battery Protection System provides Over-Discharge, Temperature and Current Protection for enhanced performance, battery cycle life and overall battery life (when used with STAR marked tool). Li-Ion Batteries offer extended run time versus Ni-Cad and Ni-MH batteries. The RIDGID 18-Volt High-Capacity 5Ah Lithium-Ion Battery provides all the power needed to tackle demanding tasks on the job site. With up to six times more run time and over twice the life of standard lithium-ion, the RIDGID 18-Volt 5Ah battery will push your tools to the limit. All Hyper Lithium-Ion batteries are built for high performance and protected from overheating, overloading and overcharging through their triple protection electronics design. Their chemistry allows for maximum performance in temperatures as low as -4 degrees F and up to 120 degrees F, so you can use it year-round in almost any climate. The new 18-Volt High Capacity Battery works with all RIDGID 18-Volt tools and is powered by Hyper Lithium Technology. Hyper Lithium is an innovative battery technology built for high performance and provides best-in-class run time, best-in-class recharges and best-in-class extreme weather performance. With an added Fuel Gauge to easily monitor your batteries charge level and triple electronics design to protect the battery from overheating, overloading, overcharging Hyper Lithium is built for high performance. 18V ONE+ LITHIUM+ HP 4.0 Ah High Capacity Battery (2-Pack) RYOBI introduces the 18V ONE+ Lithium-Ion LITHIUM+ HP 4.0 Ah High Capacity Battery (2-Pack). These batteries feature advanced electronics to allow you to maximize tool performance with added capacity to all 18V ONE+ tools. With superior runtime, power, and performance, these batteries can take on more demanding applications than ever before with the introduction of HP technology. HP technology communicates with brushless tools to maximize performance in all applications, allowing users to make faster cuts, drive larger screws, utilize bigger drill bits, etc. It has a durably constructed frame for impact protection and has a built-in 4-bar illuminated charge indicator. These batteries can be paired with over 125 tools from RYOBI's 18V ONE+ lineup. Backed by the RYOBI 3-Year Manufacturer's Warranty, these batteries include an operator's manual. Charger sold separately. 18V ONE+ LITHIUM+ HP 4.0 Ah High Capacity Battery (2-Pack) is rated 4.8 out of 5 by 14. Rated 4 out of 5 by Will from No issues so far. Great upgrade!... No issues so far. Great upgrade! Rated 5 out of 5 by Thomas from Exactly what was needed for a replacement with longer run... Exactly what was needed for a replacement with longer run time. Rated 5 out of 5 by nyr from alot more punch than the standard lithium, lasts way longer. put down 55 10 foot deck boards with... alot more punch than the standard lithium, lasts way longer. put down 55 10 foot deck boards without a recharge or loss of power!! Rated 5 out of 5 by KH from These batteries last alot longer the the original. Great price as well. These batteries last alot longer the the original. Great price as well. Rated 5 out of 5 by William from Great price for 2-pack. Both preformed as expected. ... Great price for 2-pack. Both preformed as expected. Rated 5 out of 5 by Ben from I use these batteries for impact drivers and demolition projects and they always work. I use these batteries for impact drivers and demolition projects and they always work.